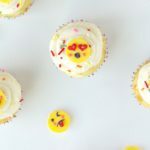 I am a sucker for cute and silly cupcakes! 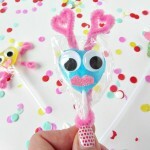 If you have been to my site before, chances are you have seen some cupcakes or other cute desserts. I don’t make anything fancy because I am not a professional. 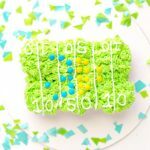 My goal with making desserts is to make them simple so myself and others can actually achieve the look. 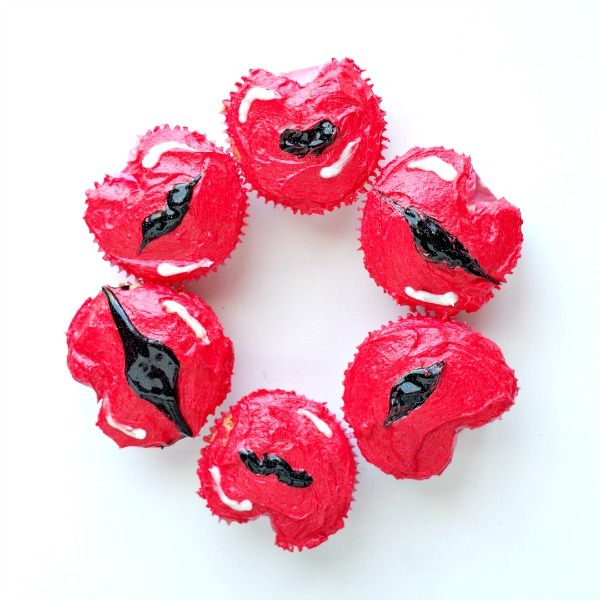 These fun little kissing lips cupcakes are really cute for Valentine’s Day. 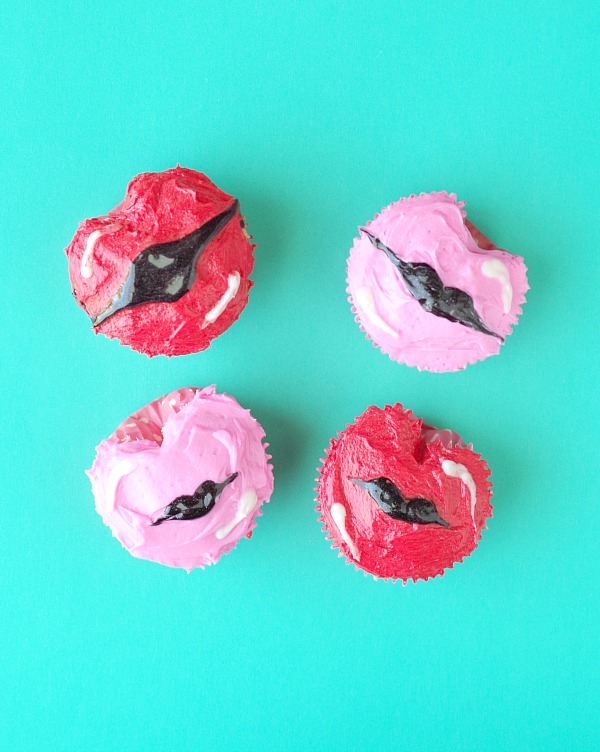 It’s a day all about love and love involves some smooches. My daughter knows I give way too many smooches. She is at the age where she isn’t wanting me to kiss her as much so I have to sneak them in when I can. She’s a little fiveager, acting like a teenager but she’s only five. It is my job as a parent to kiss her in public and embarrass her in front of her friends. 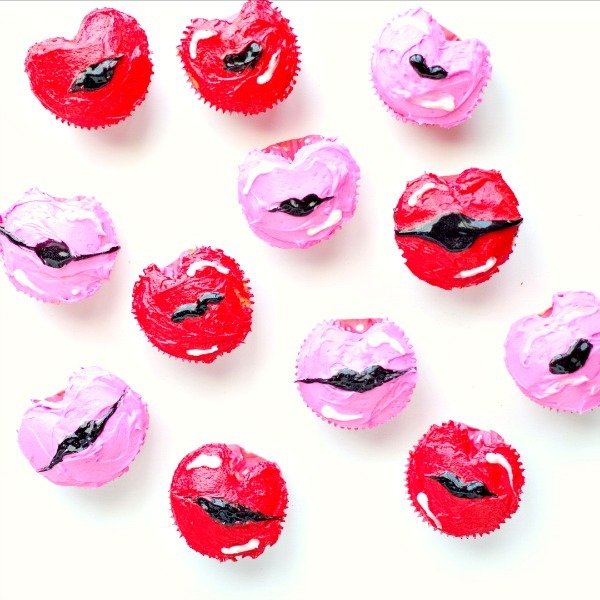 These kissing lips Valentine’s Day cupcakes are a fun treat for Galentine’s parties as well. 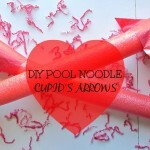 I made them a few different ways to try them out and see what looked best. I tried to give them a bit of an illustrated/cartoon look. 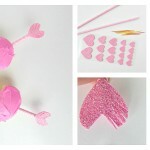 You can get creative with how to make them. 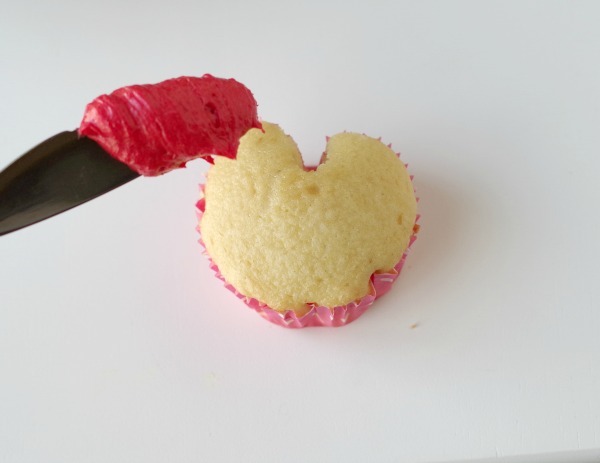 When baking the cupcakes you need to make a small indentation in the top middle part(You could also cut a small v in the middle after). I rolled up tinfoil in to small balls and put them in the top middle above the cupcake liner in a muffin tin. 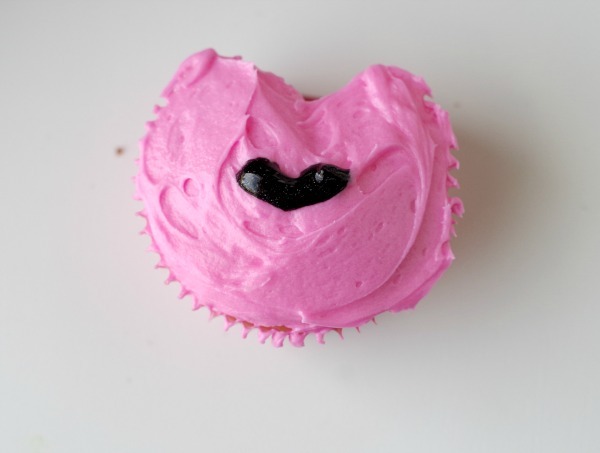 You can also add a marble above the cupcake liner to get it to stay nicely in place. I didn’t have any marbles so I improvised! 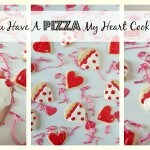 Here is a tutorial for making heart shaped cupcakes using marbles at Better From Scratch. It’s the same technique. Spread frosting over the cupcake. 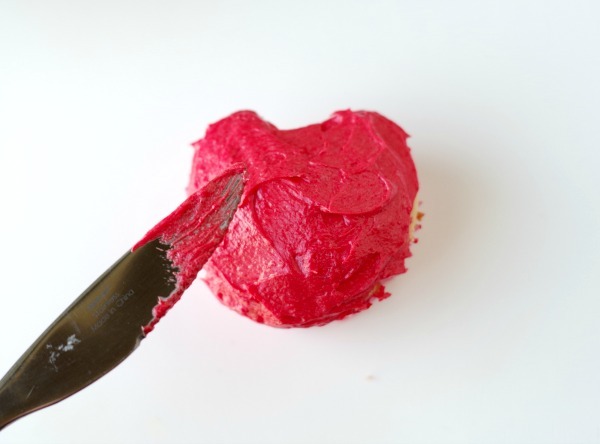 I made red and pink frosting using buttercream frosting and red food coloring. 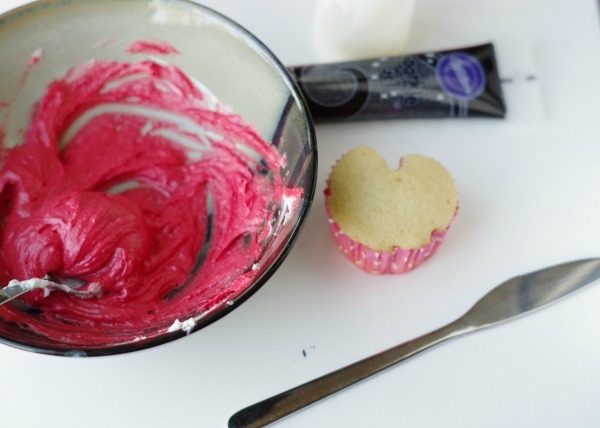 To get light pink you add just a tiny bit of food coloring. Use gel food coloring to get deeper colors. Add black gel icing in the middle. I made it in an oval shape slightly rounded down in the top middle aligned with the top u shape. 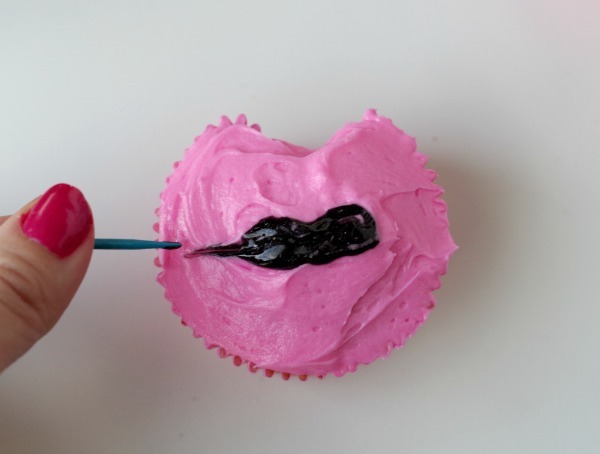 Another way to make the lips is to make a small heart shape in the middle using the black gel icing. 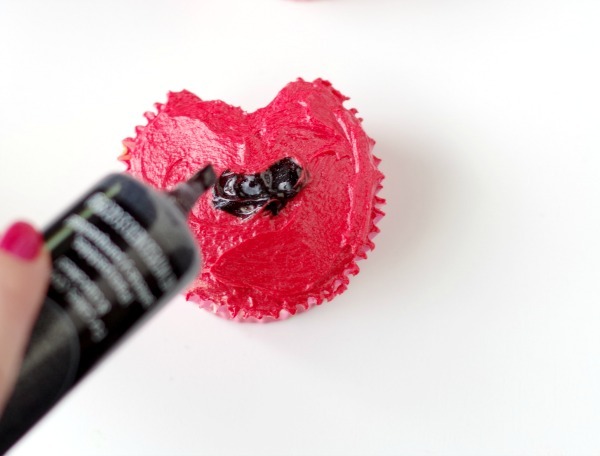 Spread it around a bit with a toothpick or just spread the black gel icing out to the sides in a straight line. If I was doing it again I might make the middle part smaller and not spread it all the way out to the sides just slightly out. 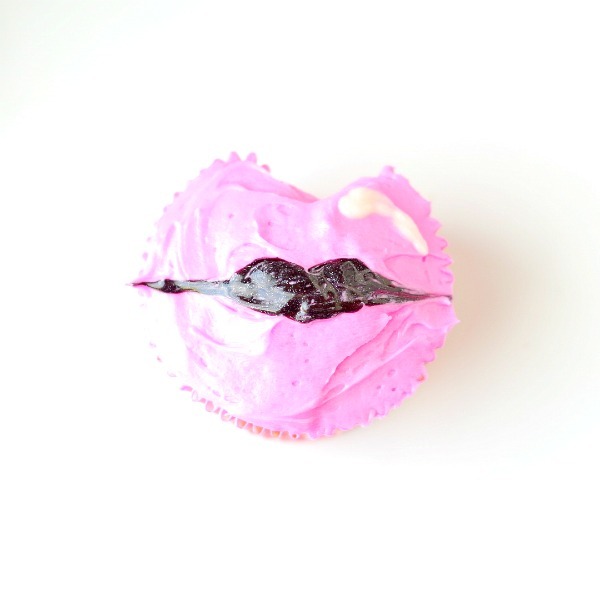 With white frosting in a plastic bag or candy bottle add small white marks following the shape of the lips. Slightly to the right on the top and one slightly to the left on the bottom. These aren’t necessary but it adds to the illustrated look. So I’m not going to lie the pictures for these didn’t turn out the best. Blogger problems, ocassionally my pictures look grainy after the fact(not on my camera) and I’ve already eaten/given out the cute photo subject. They looked waaayy cuter in person and I really had fun making them.